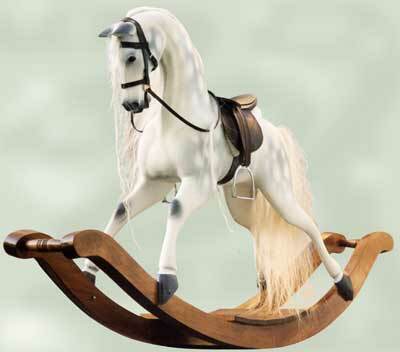 The Kensington Rocking Horse Company is based in Sussex UK. This rocking horse company, rocking horse restorer and rocking horse shop is ideal for those in search of just the right wooden rocking horse or plush rocking horse. The Victorian rocking horse stable is considered by many to be the finest rocking horse selection in the world. It unites a small group of the most skilful, talented and experienced makers of the traditional rocking horse in the UK. These beautiful traditional rocking horses are augmented by a selection of award-winning childrens rocking horses and rocking horse toys for the younger child at more accessible prices. You can buy a child rocking horse or a baby rocking horse. We also provide rocking horse restoration by expert rocking horse restorers. The repair and restoration of your horse will be undertaken by an experienced rocking horse restorer. For the main website of The Kensington Rocking Horse Company, pPlease follow this link to the main rocking horse website. You are very welcome to view at our showroom and rocking horse shop in Sussex where you can see a good selection of our handmade classic wooden rocking horses, many of which are available for immediate sale. Visitors may also consider our antique rocking horses and vintage rocking horses. Most visitors are not only captivated by our rocking horses, but are also struck by how much they learn about the sheer variety rocking horses available and about their own preferences. Incidentally, if you would like to make a rocking horse, we can advise on wooden rocking horse plans and rocking horse accessories. No rocking horse brochure or photo on a rocking horses website is a substitute for being able to meet, touch, stroke and ride the real thing. For the very young child, who may not yet be ready for a full-size, carved rocking horse, we offer a range of award-winning and stylish child's rocking horses. These are superior smaller rocking horses at modes prices. Our champion children's rocking horse has even been voted Europe's best rocking horse for children under five. The horses can be viewed at the showroom and also purchased by mail order. Our main Southern Counties Showroom and Rocking Horse Shop is situated near the South Downs and the Sussex coast at The Granary Rural Business Centre at Broad Farm on the A267 near Hellingly in East Sussex. You are most welcome to pop-in for a browse and a chat without any obligation, but please do contact us in advance to check opening times if you are planning a special journey. These are beautiful wooden toys for children, but are actually made with adults in mind. Indeed, many adults buy them for themselves. Just a reminder that this is no longer the main website, so please click on this link to The Kensington Rocking Horse Company.